everything you need to know for bringing scandinavian design to your home. We’ve long admired the clean cut aesthetic and effortless simplicity of Scandinavian design. So when it came to picking out our favorites narrowing the choices down was a little tricky. Presenting in no particular order, 50 of our favorite Scandinavian spaces and why. Patterned wood flooring provide a pleasant contrast against the soft gray walls of this elegant space. From the leather sofa to the colorfully patterned floor piece, there are no shortage of vibrant details in this eye-catching living room! Note how the more bold shades are concentrated within the center of the room, while the muted pastels are clustered around the back to provide a more cohesive flow among the influx of colors. Blush-toned florals instantly brighten up the black and white details of this cozy living room. 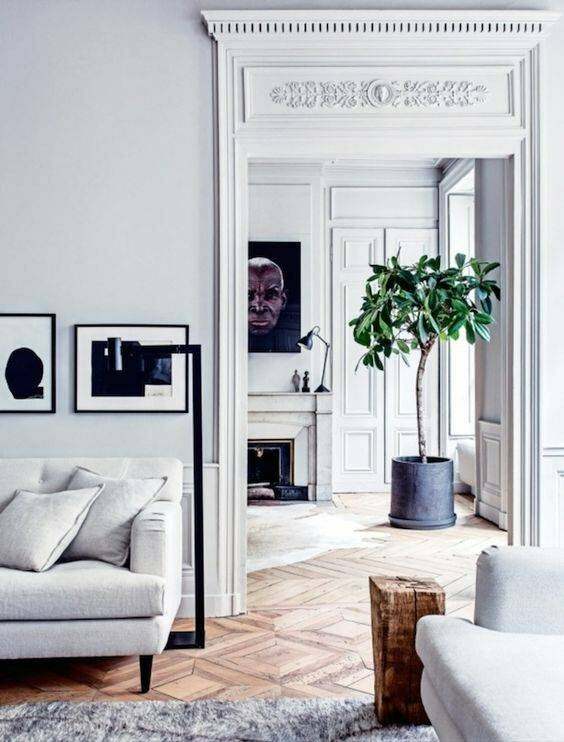 Inside this gray-washed living room a carefully curated and structured gallery wall sets a defining element to the decor. This stunning two-toned room proves that an accent wall in a captivating shade can make up for a lack of elements elsewhere. A flawless combo of white and wood, filtered with muted pastels and simple patterns. A wooden floor and matching ceiling instill a bucolic backdrop for the minimalist elements of this serene bedroom. A massive plant captures the eye yet feels much like an effortlessly chic and integral aspect of this Scandinavian room. When it comes to the little ones, an abundance of color and pattern are a major plus! Inside this minimalist Swedish cabin, a muted decor scheme allows for the polished log details to function as the center of the room’s focus. Recreate this Scandi-chic reading nook in your own space with an enveloping seat coupled with cozy textures and a side table. White on white subway tiles lend an ever-so-softest hint of contrast to this monochromatic kitchen. Two very vibrant and powerful shades fuse in effortless harmony in this mid-century mod living room. The secret? A whitewashed space with soft gray floors and a minimalist approach to the decor. Inside this whitewashed patio nook, an eclectic assortment of linen throw pillows and vibrant greens complement the natural aesthetic of the room. Rustic meets Scandinavian design inside this bucolic kitchen, where an eclectic assortment of textures and finishes contribute to the charming aesthetic of the space. A black-washed accent wall makes for quite an impressive and impromptu entry for the space that lacks one. A modest living room setup composed of a mere handful of essentials would not be complete without a statement floor piece. Saturated pastels instantly brighten up the sleek, mid-century modern furnishings of this Nordic flat. For the room composed of clean cut lines and a reserved decor scheme, overly textured elements or eye-catching wall art are always a must. A potted fiddle leaf fig tree inspires an organic detail within the exclusively Scandinavian details of this ultra chic living room. Inside this dual-toned living room, exotic textiles and bold textures make up for a lack of color. For the fearlessly colorful space, utilize patterns to instill moments of relief within the overly saturated scheme. Inside this charming whitewashed bedroom, stonewashed linens provide just about all the texture the room could ever need. There’s no such thing as having too many colors in a single room so long as they are of a generally similar tone or style. A soothing shade of royal blue is reserved for the statement furnishings of this mod living room, creating a luxurious inviting aesthetic. A muted pairing of decorative elements accentuated by earthy details inspire warmth to this makeshift bedroom closet. A playfully pink sofa complements the soft lilac wall paint while the sleek copper coffee table instills a more mature vibe to the design. Further proof that a black and white decor palette can be just as exciting as one with color. Daring wall art and fresh florals strongly encouraged. A muted aesthetic is elevated by a modest handful of subtly patterned accents and pops of color. A minty color block lends a stylish element and a much-needed pop of color to this whitewashed home office. A flawless example of a Scandinavian design scheme earmarked for the little ones. We can’t get enough of the playful wall patterns and color block! A matte wall paint emulates the Scandinavian mantra of ‘more is less’. Intricately designed crown moldings complement the old-world elegance of this subtly gray-washed space. A hanging chair coupled with a cozy pillow and throw complete this modestly decked space. A lone hanging bulb above the dining table challenges all conventions of traditional lighting. Consider it clean cut minimalism at its best. Multi-colored chairs lend a light-hearted note to the stark white details of this dining room. Incorporate a more masculine aesthetic into a space by opting for smokey furnishings of various styles and makes. A wood-paneled ceiling adds plenty of charm and character to this exclusively contemporary space. An inverted color block lends a dynamic characteristic to an otherwise stark space. A wooden door extends an earthy element to an otherwise modern decor scheme. A space carved out for the firewood below the fireplace inspires a rustic touch to the streamlined details of this dining room. A wildly textured landing pad of a monochrome scheme extends warmth throughout the whitewashed furnishings of this Scandinavian space. For the ultimate modern entry, deck the space with a daring color block and a statement console. All eyes on the surreally whitewashed dining table set which coincidentally manages to steal the spotlight from the remaining elements of the room. Inside this Scandinavian studio a lack of the superfluous helps manage the flow of room as well as its furnishings. Soft wooden details fit right in with the stark white makeup of this Nordic kitchen filled with a natural assortment of decorative details.